Pontefract is an old, medieval town in West Yorkshire, England, near the A1 (or Great North Road), the M62 motorway, and Castleford. 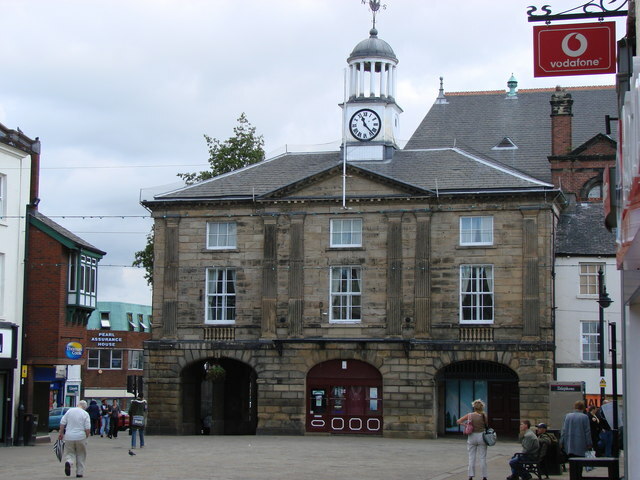 It is one of the five towns in the metropolitan borough of the City of Wakefield and has a population of 28,250. Pontefract's motto is Post mortem patris pro filio, Latin for "After the death of the father, support the son", a reference to English Civil War Royalist sympathies. The new church within the old. After the church was damaged during the civil war a new one was built within. Pontefract is well known for its historical market place, and most importantly, its medieval castle which was built in the Norman Conquest era. Pomfret castle was originally manufactured from wood, but was later rebuilt in stone over time. The state of the decident castle holds the civil war responsible, in which the parliamentarians gave heavy cannoning upon the castle. The Sandle administration is the main culprit for this. However, in the late 19th century, the locals in Pontefract decided that certain areas of the castle be demolished due to unknown reasons. Local tradition asserts that Pontefract's name originates in the Latin Pons Fractus, "Broken Bridge" Another theory is that it is derived from "Pont" meaning bridge in both Latin and late British and the late British name for York, Efroc, Thus "York Bridge". The town is situated on an old Roman road (now the A639), described as the "Roman Ridge", which passes south towards Doncaster. The area which is now the town market place was the original meeting place of the Osgoldcross wapentake. Although Pontefract itself does not appear in the 1086 Domesday Book, an area of the town, known as Tanshelf (Tateshale), does. There are the remains of an Anglo-Saxon church and cemetery at The Booths, near the castle. The oldest grave found dates from around 690. The church is likely to be the one mentioned in the DB records for Tanshelf / Tateshale. Pontefract suffered throughout the English Civil War. The castle was noted by Oliver Cromwell as "[...] one of the strongest inland garrisons in the kingdom." However, three sieges by the Parliamentarians left the town impoverished and depopulated. After the end of the Third Siege (24 March 1649), Pontefract inhabitants, fearing a fourth, petitioned Parliament for the castle to be demolished. In their view, the castle was a magnet for trouble. On 5 April 1649, demolition began; although efforts were extensive, the crumbling sandstone ruins of the castle remain today and may be visited. Pontefract was the site of Pontefract Priory. This Cluniac priory was founded in 1090 by Robert de Lacy, and dedicated to St. John the Evangelist. It was dissolved by royal authority in 1539. The abbey maintained the Chartularies of St. John, a collection of historic documents later discovered by Thomas Levett, High Sheriff of Rutland and Yorkshire native, among family papers. Levett gave the chartulary to renowned Yorkshire man Roger Dodsworth. The chartulary was later published by the Yorkshire Archaeological Society, giving scholars a rare glimpse into life in medieval Yorkshire. In 2007, a suspected extension of Ferrybridge Henge—a Neolithic henge—was discovered near Pontefract during a survey of the area in preparation for the construction of a row of houses. Once the survey was complete, the construction continued. Pontefract's deep, sandy soil makes it one of the few British places in which liquorice can be successfully grown. The town has a liquorice-sweet industry; and the famous Pontefract Cakes are still produced, though the liquorice plant itself is no longer grown there. The town's two liquorice factories are owned by Haribo (formerly known as Dunhills) and Monkhill Confectionery (part of the Cadbury's Group - formerly known as Wilkinson's), respectively. A Liquorice Festival is held each year. Poet laureate Sir John Betjeman wrote a poem entitled "The Licorice Fields at Pontefract". Close by is the large, coal-fired power station at Ferrybridge. There are Tesco and Morrisons supermarkets, and most recently Asda, which changed hands from Kwik Save. The schools in the town are Carleton Community High School, in Carleton, and The King's School, on Mill Hill Lane; both are comprehensive schools, for ages 11–16. Pontefract is locally renowned for its numerous pubs. One of the oldest buildings, dating from the 16th century and previously used as a shop, was turned into a pub in the 1990s, called the Counting House. Pontefract General Infirmary is a large general hospital, beneath which is an old hermitage, open to the public on certain days. It is the first place at which infamous serial killer Harold Shipman began to murder his elderly patients. The hospital is currently being rebuilt and will reopen in 2010. Pontefract Museum, from which the hermitage schedule can be obtained, is in the town centre, housed in the former Carnegie library. There is now a modern library building. Unlike many towns of its size, Pontefract has three railway stations: Pontefract Baghill, on the Dearne Valley Line, which connects York and Sheffield; and Pontefract Monkhill and Pontefract Tanshelf, which connect with Leeds and Wakefield. Pontefract has a park with a racecourse on the outskirts of town. Pontefract Racecourse is the longest continuous circuit in Europe at 2 miles and 125 yards (3,300 m). It stages flat racing between the end of March and the end of October. Nearer to the town centre are the Valley Gardens, with a love garden, an aviary, and an avenue of cherry trees, which bloom in the spring. Although the trees continue to attract admiration, the gardens have become quite depleted and the aviary has been vandalised. Pontefract swimming pool is on Stuart Road. Life in Pontefract was satirised by J. S. Fletcher in his book The Town of Crooked Ways, whose title is held to have been purposefully ambiguous, being a reference either to the medieval layout of the town, or to the behaviour of its inhabitants. More recently, Pontefract has seen its share of scandal, in the form of the Poulson affair, in the 1960s. Andy Carrington is also one of the town's resident writers, and has written numerous poems, short stories and articles relating to the area -- including a parody of Sir John Betjeman's popular poem "The Licorice Fields at Pontefract". Pontefract is home to North-East-Wakefield College (more commonly known as NEW College), which has ranked in the top 25 colleges in the United Kingdom for the past few years. Pontefract is also home to All Saints Church, built over ruins of an original church, which was destroyed during the three Civil War sieges of Pontefract Castle; the church's bell tower staircase is the famous 'double helix'. Pontefract currently is part of the Pontefract and Castleford constituency and the Labour Party have a majority in this area in Westminster. However, in local politics there are Conservative Party councillors sitting on the local council. Pontefract's local newspaper is the Pontefract and Castleford Express. Pontefract is known for its 'down-to-earth' nightlife, sporting one of the most concentrated numbers of public houses in the UK, with such venues as Big Fellas, The Counting House, The Elephant, The Green Dragon, The Tap and Barrel, The Malt Shovel, The Blackmoor Head (commonly known by locals as the "Blackie Moor") and the newly opened Wetherspoons Bar, The Broken Bridge in pontefract. Some of these pubs have had many different groups performing over time; The Ridings, Jack's aTTic and Mother Of The Gold are a few groups that play Pontefract venues frequently. Pontefract Park contains a small pond suitable for fishing. There is also a pitch and put golf green and children's play area. ^ a b "BBC - h2g2 - Yorkshire's Castles: Pontefract Castle". www.bbc.co.uk. http://www.bbc.co.uk/dna/h2g2/A2350108. Retrieved 2008-07-22. ^ "Ferrybridge Henge extension discovered in West Yorkshire". Culture24. 2007-08-30. http://www.culture24.org.uk/history+%2526+heritage/archaeology/art50167. Retrieved 2009-12-07. ^ "Course Details - Pontefract Racecourse". http://www.pontefract-races.co.uk/course-details/. Retrieved 2008-07-04. This page uses content from the English language Wikipedia. The original content was at Pontefract. The list of authors can be seen in the page history. As with this Familypedia wiki, the content of Wikipedia is available under the Creative Commons License.